Greetings friends and fellow crafters, LeeAnn here with my weekly White Rose Crafts design team project. Today I used two of the Kelly Creates Sentiment Stamp Sets and 2 6"x6" paper pads for my projects. Let me tell you, these stamp sets sure are an awesome value for your money. Not only for the number of stamps you get, but the fact that you can use them in conjunction with the tracing paper pad to learn Brush Writing. 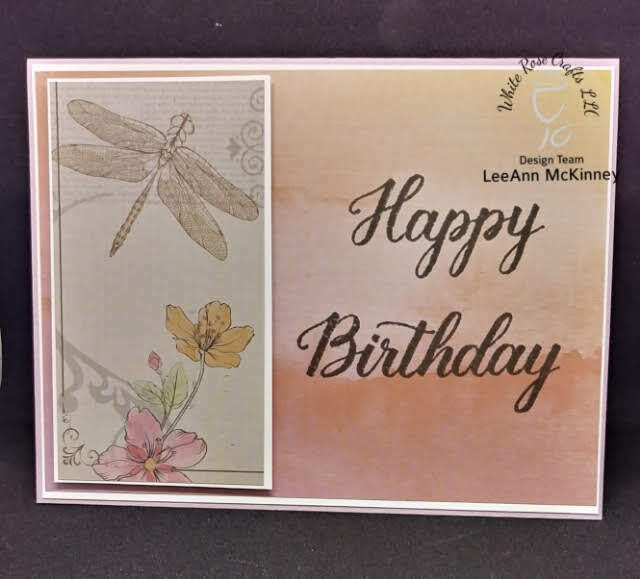 For my first project I have an A2 kraft colored card base, my white layer, and then from the Ultimate Crafts L'aquarelle Designs 6"x6" paper pad. The dragonfly and flower panel is from the opposite side of the watercolor panel. I used the Happy and Birthday words from the Kelly Creates Congratulations set for my sentiment. I stamped using Versafine Onyx Black Ink. 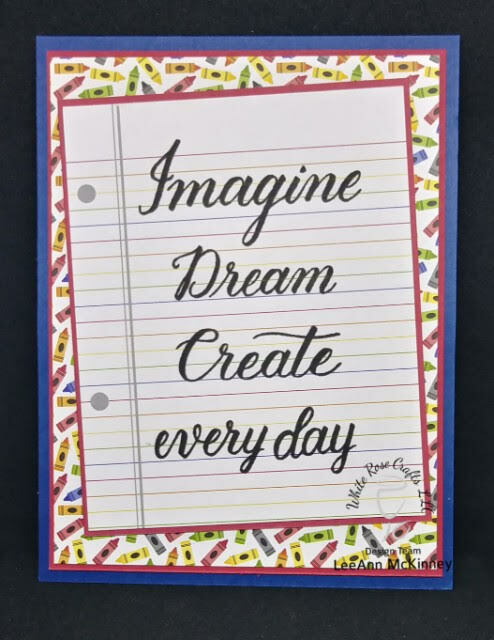 For my second project I used Red and Blue cardstock from my stash, the panel with the crayons as well as the notebook panel are from the DoodleBug 6"x6" Back to School paper pad, I stamped the sentiments from the Kelly Creates Quotes 3 Stamp set using Versafine Onyx Black ink. 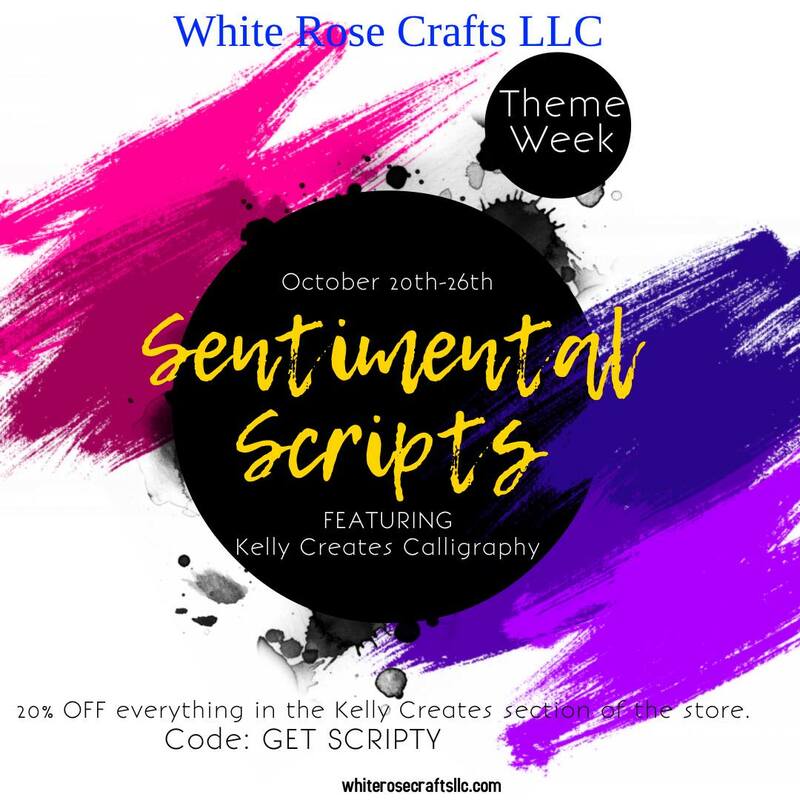 Use the code: GET SCRIPTY in the store for 20% off the Kelly Creates line of products. This is really pretty. I love the dragonfly. I found your blog through SumMore Stamps where I also applied for a GDT spot. I wish you the best...you're truly talented. Also, I run a fun challenge blog (always Anything Goes with awesome prizes) and I'd love to have you play along and share your talents with us. Hope to see more of you. I always enjoy making new blog friends. I'd love to have you follow my (personal) blog and I'll follow yours if that's ok w you.